The competition at our first ever U1800 Class Championships was fierce. Along with several regulars of our quads, there were some relative unknowns, as well as a few up and coming juniors, leaving the stage set for many exciting encounters and upsets. After the first three rounds it was Matthew Chan who was the only player left with a perfect score. Chan had started off in the middle of the pack, but showed much determination by defeating many of the top seeds in the tournament. Often players who start off on a hot streak are unable to maintain it, however, Chan showed that he was up to the task and won his remaining two games to win the tournament with a perfect 5/5 score! Chan also picked up an amazing 100 rating points! In second place with a solid performance was CCFC regular Leo Bykhovsky. 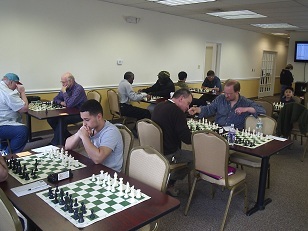 Third place was a tie between Melvin Patrick and Hubert Herring. Great finishes were put in by Michael Morin and Henry Stratakis-Allen who won the U1600 and U1400 respectively. Congratulations to all of the winners and we are looking forward to seeing everyone again soon!